- Fashion canvas travel duffel bag perfect for everyday use, with all your daily bits. - This cool large weekend travel bag works well with a variety of different outfits and casual styles. - A great gift choice, it's fit for outdoor, travel, shopping, beach, school. 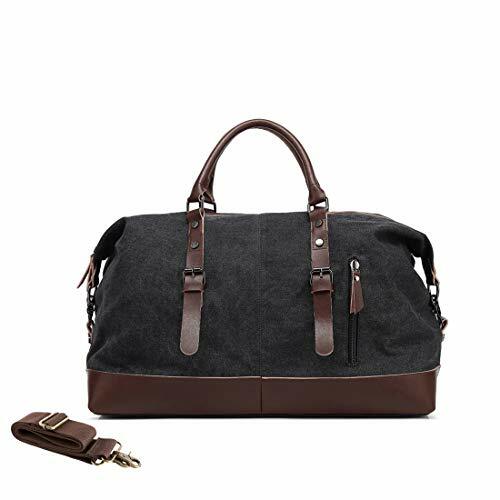 ✔MEWAY DESIGN DUFFEL BAG : Oversized Flight Bag / Weekender Bag / Sport Overnight Travel Bag / Canvas Gym Bag / Carry on Luggage / Military Bag / Travel Bags for Men and Women. ✔PREMIUM MATERIAL : Made of 100% thick Cotton canvas + Genuine top Crazy Horse Leather. Durable , Wearable and good heat resistance, The base and handles are PU leather sewn. The Crazy Horse Leather will look even better as it ages. ✔HIGH CAPACITY & MUTI-FUNCTIONAL : 2 External Front Pocket on each side, 2 Side Zippered Compartment, SBS Zipper and Quality Hardware ensure easy maintenance and long-term usage. Adjustable, Removable shoulder strap has really nice metal buckle on each end that hook to metal hoops on the bag as well. ✔EASY & COMFORTABLE TO USE : It's suitable for carry-on and flight. Perfect as a oversize travel bag for men with shoulder strap, easy to carry , make it comfortable and easy to wear cross body or on your shoulder during the trip. Two solid carry handles on both sides , allow carried by two people easily if the bag is too heavy. ✔FOR TRAVEL & MORE : This bag is perfect to people for flight travel or overnight trip or family weekend holidays. It is great travel bag for men, women, boys and girls to take in Outdoor Travel, Camping, Climbing, Weekend, Trips, Sports, Gym, Fishing and more outing activities.